The government was informed about Vitals Global Healthcare’s intention to sell its 30-year concession to run three State hospitals three months ago but made no announcement. After reports appeared on social media, the government said on Thursday VGH would be handing over its concession for running the St Luke’s, Karin Grech and Gozo hospitals to American operator Steward Health Care. The announcement itself and the timing of the sale, just 21 months after VGH signed a controversial agreement through which taxpayers would pay €2.1 billion for medical services, took many by surprise. However, a VGH spokeswoman said the company had always been open to “strategic investment and partnership”. Also, discussions were held with various “players” in recent months, she added. A spokesman for the Office of the Prime Minister would not say how long VGH had been eyeing the sale of the concession but confirmed that the government was informed of the negotiations three months ago. Asked whether the sale of the concession soon after the deal with VGH was finalised rendered the health system a commodity, as happened with passports and seemed to be the case with education, the spokesman said it was not the case. He said comparing the healthcare system to the passport or education system implied “a lack of understanding of the issues at stake”. “Speculation on government plans on the educational system, which the government categorically denies, is irresponsible. May I remind you also that parts of our education system are also managed by the Church and the private sector,” he said. Taking the conventional methods to upgrade the healthcare system, he continued, would have taken “four times as much time to achieve the targeted results”. Questions on comments made by Health Minister Chis Fearne that the deal with the new operator was “the real thing” and whether this was an admission that Vitals was never up to the task went unanswered. Steward Health Care is the largest private healthcare operator in the US, where it is responsible for 36 hospitals employing about 37,000 professionals. In a statement announcing the change in operators, the government said the agreement “will continue to deliver free and world-class healthcare facilities in Malta”. The government said that all agreements VGH had with it and medical professionals would be honoured, but no further details were given. Questions have been asked about whether the resale of the concession could have been planned from the outset. It has now emerged that former Vitals CEO Armin Ernst worked simultaneously for both VGH and Steward. According to his LinkedIn profile, Dr Ernst, who resigned from his VGH post and left Malta less than a year after his appointment, joined Vitals in July 2016 and has served as chief administration officer for Steward since April 2015. Mr Fearne said yesterday that it was Dr Ernst who had suggested Steward should purchase the 30-year hospitals concessions. Asked about this, the VGH spokeswoman said Vitals was “una-ware that Dr Ernst was involved with Steward while engaged by VGH”. At the time of Dr Ernst’s resignation as CEO, the spokeswoman said that he had stepped down due to personal problems and he had a short-term contract that was always intended to last a few months. Questions sent to Steward regarding Dr Ernst’s role were still unanswered at the time of writing. Gozo Hospital would no longer be viable without the investment by Vitals Global Healthcare and Barts Medical School. For these hospitals to attract patients from America and Canada, which will be covered by insurance companies, we need the highest possible standards, so even in that aspect, we need to be tops. So we are raising our standard for locals, too. The VGH business model is medical tourism. We now have additional comfort that government’s partner [Steward] in the PPP has a strong track record in healthcare… This is the real thing. The VGH sale had caused more uncertainty among State hospital workers and patients, the Nationalist Party said. It said this development had proved how right it was to insist that the sector was too important to be left in the hands of a company with hidden beneficiaries and without any experience in the sector. 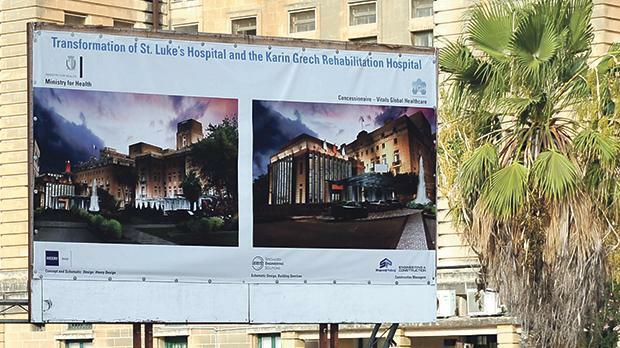 The Labour government, the PN added, had entered into a secret agreement with VGH to privatise St Luke’s, Karin Grech and Gozo hospitals, an agreement costing more than €2.1 billion in taxes. Only a few days ago, Health Minister Chris Fearne tried to distance himself from the agreement and this confirmed the government’s lack of seriousness in the deal, the PN said. The PN said the government must say why VGH left Malta and whether it was true that the company had in fact left in March. It also questioned whether public procurement regulations were followed throughout the negotiations. It insisted that now that the government no longer had a deal with VGH, it should publish all contracts in full. The Democratic Party said the deal left many unanswered questions, adding that the original contract itself had been flawed. “The Vitals ordeal stinks to high heaven, not only since the rightful owners are unknown but also as it seems that VGH never had the intention to honour such a contract. Moreover, the government’s lack of accountability has accentuated this opinion,” it said. Although the PD welcomed that the concession was now in the hands of a recognised healthcare group with a track record in the field, “something Vitals could never boast”, it said concessions should ideally not be resold. The green light of the health regulator should be required throughout the whole duration of a concession and not only in the first five years, PD insisted. Noting that the contract mentioned the sum of €200 million, the PD wondered how much Vitals had actually invested and how much of the supposed investment consisted of recycled government funds. It said Vitals had failed to deliver on some parts of the contract and asked whether the contract should have been declared null and void as a result. “Would it not have been better for the government to rescind that contract and renegotiate more advantageous terms rather than the government abiding by terms which, time and again, the Health Minister has shown he is not comfortable with?” it asked. The General Workers’ Union said it had informed members that all agreements and guarantees they had with VGH were still in place. The GWU said it met Mr Fearne, who confirmed the deal was merely a business transfer and would not be impacting workers’ conditions.